is one of these amazing places I’ve been to in my life and I’m truly grateful for having the privilege to be able to come back here regularly. Larchant is a small village about 70 km south of Paris, in the surroundings of Fontainebleau and the immense lands and deep forests, “Parc Naturel Régional du Gâtinais français”. Larchant is famous for a few things; first the Basilica of Saint Mathurin, the pilgrimage to Santiago di Compostela in Galicia in Spain goes through here. The Basilica itself has an extraordinary history, This church is a jewel in gothic architecture, the construction work went over three centuries from the end of the XII century to the beginning of the XVI century. The rock climbing is another famous thing here, people travel from far to climb here. It’s one of those places where many climbers “practice” for bigger adventures. But not to forget, something else equally important to Larchant; which is that the immense painter Balthus, painted the Basilica of Larchant in 1939 (I’m not exactly sure about the date), not many people know about this painting which is probably the least one known of his art. 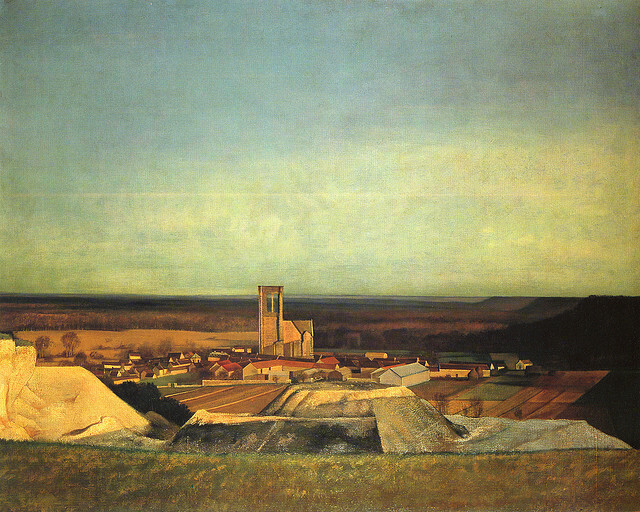 St Mathurin Basilica in Larchant, Painting by Balthus. When I spend time here I relax the most, I can just sit and contemplate the garden, read a book and of course a nice walk in the forest, all the senses are coming together, just to be able to smell the nature again…. after all the pollution which seems like the only thing I can still smell these days…. I have always been a person who prefer the city, ever since my young years, the city called me! From Stockholm to Paris and then wandering off a long way to end up in Bangkok. Now after more than 8 years, do I need the nature more?, am I longing for the country side and the mountains, the Baltic Sea and the Atlantic Ocean, am I starting to long for home? …. I have not travelled extensively in Thailand, I recognise that, so I should not say that I can’t find great and truly beautiful nature here, because I can; The Northern Thailand, the Golden Triangle and the Mekong River from Chaing Rai down to Luang Prabang in Laos, is one of the most stunning natures I’ve ever seen. But home is home and with age nostalgia comes.